For more, see Nerezi Frescoes.  What is the Proto Renaissance? In fine art, the term "Proto Renaissance" refers to the pre-Renaissance period (c.1300-1400) in Italy, and the activities of progressive painters such as Giotto (1267-1337), who pioneered the new form of figurative "realism", which was fully developed by artists during the era of Renaissance art proper. Giotto's groundbreaking art did not however, represent the European or even the Italian mainstream. Derived from traditions inherited from Christian Byzantine art - which itself influenced the murals of Romanesque painting) - the style known as Gothic art, championed in Italy by the city of Siena among others, was still the predominant style of painting and sculpture. In fact the Gothic idiom survived well into the 15th century in the form of a style known as International Gothic, which became popular in many of the royal courts across Europe, notably France, Spain, Bohemia, and England. The Renaissance proper began around 1400 in the city of Florence, but its ideals and methods did not become a dominant force in European art until the mid-15th century. The main types of art practised during the Proto-Renaissance period included: fresco mural painting, tempera panel painting, book illuminations, relief sculpture, goldsmithing and other forms of metalwork. Most of the artistic developments of the trecento Proto-Renaissance period had a direct effect on Early Renaissance painting (c.1400-90) of the quattrocento. The proximity of Rome and the Church's influence on all aspects of Italian culture, meant that most art (painting and sculpture) was religious art. Not surprisingly therefore, two churches form the gateway into the Renaissance proper. The first was the convent church of St Francis at Assisi. In the last decades of the 13th century, it was decorated entirely in fresco, by Cimabue (Cenni di Peppi), one of the most famous painters of the day. His assistant was a young man called Giotto di Bondone (1267-1337), whom he employed after seeing the youth sketch his father's sheep. The fresco scenes of the life of St Francis were portrayed with much greater realism than contemporary styles of Byzantine art. The second church was the Scrovegni Chapel (also called the Arena Chapel) built in the 1300s by Enrico degli Scrovegni, in Padua. This too was decorated with fresco murals, only this time they were wholly created by Giotto. He painted the entire biblical story of three generations of the Holy Family: the Virgin's parents, the Virgin herself and Jesus.The narrative is depicted with great drama in a comic-strip set of wooden panels, in three rows along the walls. In contrast to previous convention, these religious paintings have a three-dimensional quality, a sense of depth and space, achieved through Giotto's unprecedented use of modelling, shadow and linear perspective. Not only do his figures look real, they possess a heroic stillness - an attribute which becomes a key hallmark of Christian art during the Italian Renaissance proper. Giotto - The "Father of Painting"
Giotto de Bondone (c.1266-1337) opened the door to a whole new world of painting, as Giorgio Vasari was the first to recognize, in his Lives of the Artists (1550), when he credited Giotto with reviving the true art of painting, introducing the drawing of nature, and restoring Italian art to its ancient greatness and prestige. As a result, he designated the artist as the "Father of Painting". Under Giotto, Italian painting became the leading European style of art until well into the 17th century. After 1311, aside from longer stays in Milan and Naples, his traces can be discerned in Florence. Other major works have been partially preserved in the Frescos of the Bardi and Peruzzi Chapels (created after 1320) in the Franciscan church Santa Croce in Florence. Giotto was also active as a painter of altarpieces, and as an architect (campanile of the Florence Cathedral). For more about the Florentine Renaissance and the city's famous duomo, see: Florence Cathedral, Brunelleschi and the Renaissance (1420-36). Among Giotto's contemporaries, the poets Dante and Petrarch have commented that he was the first to introduce reality into fine art painting. He filled a comprehensible pictorial space with realistic individuals with naturalistic rounded forms, in contrast to the flatly conceived and linearly decorated imagery of a Byzantine madonna, or even a madonna image of his teacher Cimbue. In short, Giotto junks the unrealistic Medieval religious images and enables viewers to identify themselves with the woman on the throne - a way of painting that shook religious art to its foundations. What's more, in his religious history painting Giotto was able to simultaneously depict a succession of moments in time, thus vastly enhancing the current practice of pictorial narration. He arranged in a single pictorial frame scenes which actually occurred sequentially in the biblical text. Towards the end of Giotto's life (1267-1337), the Florentine authorities completed the construction of the Piazza della Signoria, which became the focal point of the city. With its Romanesque-style town hall - the Palazzo Vecchio - and its many statues, it became the artistic as well as the civic centre of Florence. Giotto's most important students are Maso di Banco (active around 1330-1350), who developed a special sense for abstract surface effects (Bar-di-Vernio Chapel, Santa Croce, Florence. c.1330-1340) and Taddeo Gaddi (c.1300-1366) who introduced experimental illumination effects into fresco painting. Giotto also had a significant influence on the more conservative Sienese School of painting, in Siena - a fierce civic rival of Florence. In addition, all subsequent Old Masters of the Renaissance era including the Italians Masaccio, Mantegna, Leonardo Da Vinci, Raphael, Michelangelo and Titian, as well as the Dutch and German painters Roger Van der Weyden, Van Eyck, Hieronymus Bosch and Albrecht Durer were highly familiar with Giotto's work and acknowledged his contribution to the history of art. The small Byzantine monastery Church of St. Panteleimon in Gorno Nerezi, Republic of Macedonia, was built in 1164 and its frescoes are celebrated examples of Comnenian Age Byzantine Art, representing the Passion of Christ and several other hagiographical illustrations. Similar examples of Macedonian medieval wall painting have been found in the Latomou Monastery in Thessaloniki. Above all, these murals demonstrate that Byzantine (and its most famous offspring Gothic) painting, was not the static type of art that some Renaissance scholars have assumed it was. Insofar as this raises the possibility that the Byzantine/Gothic style might have developed on its own into something like the "Renaissance style" (I have my doubts on this - Editor), it qualifies Giotto's enormous contribution to the development of Western painting. In Siena, it took longer for religious painting to move away from the Byzantine tradition (see Romanesque Painting in Italy) - a development that Giotto had accomplished in one leap. As a result, for many years, early 13th century Sienese painting unjustly stood in the shadow of Giotto and his school. Where Giotto employed block-like volumes to enhance his figure painting, line remained everything for the Sienese leader Duccio de Buoninsegna (1255-1318). However, in both beauty of line and graphic development, as well as in the richness of his materials and colours, Duccio is in no way inferior to Giotto, and in fact his imaginative narration, his drawing, his sensitive gradations of colour, and surprisingly deep pictorial and landscape spaces, even surpass those of the Florentine artist, as seen in Duccio's Scenes from the Life Of Christ on the reverse side of the Maesta Altarpiece (1308, Museo dell'Opera Metropolitana, Siena), the gigantic former altar painting of the Cathedral of Siena. On the front, Mary sits amid a circle of saints, in an early rendition of the 'holy conversation'- a painting theme that later became popular in the Florentine quattrocento. Duccio's student Simone Martini (1284-1344) presents a still broader spectrum of themes and styles. He also made his start in Siena with a Maesta (1315), painted as a fresco for the Palazzo Publico in a courtly variation on Duccio's altar painting in the cathedral. His masterpiece though is the exquisite Annunciation Triptych (1333), painted for Siena Cathedral. 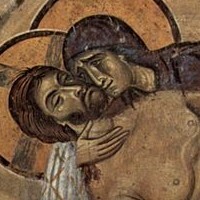 Martini's further work in Italy increasingly reveals influences from late French Gothic book painting, as evident in the frescos of the Martin's Chapel in the lower church of San Francesco in Assisi, and the artist in fact became a court painter in Naples to Robert I of Anjou in 1317. From Martini we learn far more about courtly life of the trecento than from Giotto, who pursued timelessly classic religious pictorial images which existed apart from daily life. Martini slowly worked his way to Avignon, although his works there have not survived. Two other noteworthy Sienese painters were the brothers Ambrogio Lorenzetti (c.1290-1352) and Pietro Lorenzetti (c.1280-1348) - in all probability students of Duccio. 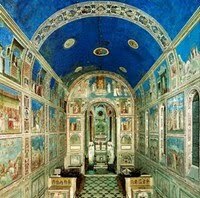 Their altar paintings and frescos, which also reveal some influence of Giotto, are more emotional and more lively than those of their Sienese contemporaries. Ambrogio Lorenzetti's greatest masterpiece, the monumental Allegory of Good and Bad Government (1338-9, Palazzo Pubblico, Siena), is not only the first landscape and cityscape in European art, but also reveals an understanding of the city government of Siena in its innumerable details. In 1309, anarchy in Rome led to the transfer of the papal court to the old southern French city of Avignon. 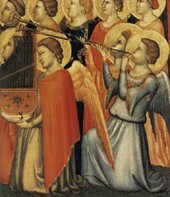 The presence of this wealthy source of patronage attracted many artists including Simone Martini and, reportedly, Giotto. As a result Avignon blossomed as an artistic centre and became the launching pad for the dispersal of Italian art northward into Burgundy, central France, and the Netherlands. At the court of Avignon, the late Gothic observation of nature, poetry, mystical theology of the devotio moderna, united with Italian beauty of line. Book painting became the medium of the hour: at once luxurious and easy to pack and transport, illuminated books became collector items. They both enhanced the honour of courtiers and princes such as the Duc de Berry in Bourges (the brother of Philip II, the Bold, of Burgundy) and served in private worship. Among the multiplicity of high quality miniatures, the work of the Parisian master Jean Pucelle (c.1290-1334) dominated the first half of the 14th century, followed later by the Limbourg Brothers (c.1380-1416). Commissioned by the Duc de Berry, they produced several illuminated manuscripts or 'books of hours', including masterpieces like Les Belles Heures (1408, Metropolitan Museum of Art, The Cloisters, New York) and the Tres Riches Heures du Duc de Berry (1413-16, Conde Museum, Chantilly) "the most tender and finest creation of miniature art," according to historian Johan Huizinga. With their detailed illustration of the annual cycle of nature, these early 15th century books of hours represent the first series of genre pictures in the history of painting. They anticipated later religious pictorial inventiveness, and their deeply boxed interiors prepared the way for the art of Jan Van Eyck "in miniature." Panel paintings and murals reveal a correspondingly less independent profile, aside from the work of various regional schools, such as that in Provence around 1400. Jean Fouquet (c.1420-1481), as a miniaturist and panel painter, also forms an exception, and essentially founded French painting: see his extraordinary Melun Diptych (1450-55). Between approximately 1370 and 1430, a similar phenomenon appears throughout European painting from England, through France, Burgundy, northern and central Germany, Bohemia, Austria to Italy. Characteristics of the International Gothic style came together in the sculptures of the "Beautiful Madonnas, in the panel paintings, murals, and book painting of the age, as well as in goldsmith metalwork. Sculpture, illuminated manuscripts, and devotional pictures functioned both as a medium of diplomacy and as gifts between courts and governments. A refined courtly culture - for whose style initially the Bohemian Habsburg court of Emperor Charles IV, and later the courts of the Burgundian dukes, set European standards - celebrated itself in painting in the form of shimmering gold backgrounds, delicately changing colours, subtly moving garments, preciously refined gestures, and the ambiguously smiling faces of saints and angels. Stemming from the early years of the period, the private chapels of Emperor Charles are comprehensive works of art which incorporate precious stones with panel painting, frescos, and liturgical equipment. In Italy, the late gotico internationale occured at the same time as the early Renaissance, and enjoyed equal favor from contemporaries. Influences deriving from the work of Lorenzo Monaco (c. 1370-1425), Gentile da Fabriano (c.1365-1427) and Masolino (1383-1440), are still evident after 1498 in Botticelli's late religious work. In Burgundy, the Flemish pioneer Melchior Broederlam (c.1350-1411) pointed the way to the art of Robert Campin and Jan van Eyck, whereas in Germany, painters of the School of Cologne, in particular Stefan Lochner (c.1405-1451), and in the north the Masters Bertram (c.1340-1415) and Francke (c.1380-1430), combined the linearity of Bohemian courtly art with the richness of details found in French book painting and the early Dutch masters. Note: Works reflecting the style of Proto Renaissance painting and illuminations can be seen in some of the best art museums in the world.  For more about 14th-century fresco painting in Italy, see: Homepage.